Relax and take a The Shaver Lake Power Center is located in the little community of Shaver Lake, about 35 miles from the San Joaquin Valley communities of Clovis, Fresno and Madera. Here you're in the Sierra National Forest, definitely the land of adventure. Arrange to rent one or both of our Polaris snowmobiles. We have two snowmobiles available to rent. One is a Polaris RMK 600 and the other is a Polaris RMK 800. 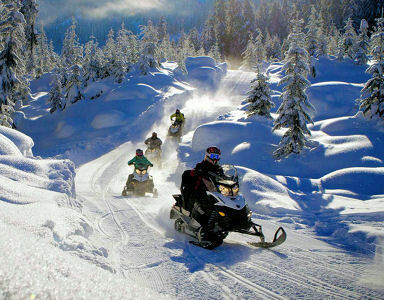 The rental rate per snowmobile is $350 per day (8 am to 5 pm), with a $500 credit card security deposit. You can tow the snowmobile on our trailer (a 2 inch ball is required) or we can deliver them to Huntington Lake for $50. All rentals will go out of Huntington Lake and must stay on the groomed trails. Age limit to ride is 5 years old and up. You must be a licensed driver and at least 18 to rent these snowmobiles.